Brown rice has health benefits, and is more nutritious than white rice; also change from white to brown rice can reduce the risk of diabetes, so choose the best option; but must take into account that also has drawbacks. In a study published in the “International Journal of Food Sciences and Nutrition” in 2006, maintains that eat brown rice maintains levels lower blood glucose after meals, when white rice is eaten, and produces higher effect in participants with diabetes compared with healthy participants. This effect may be due to their high levels of fiber, polyphenols, phytic acid and oils found in brown rice, and can also reduce the risk of heart disease, gastrointestinal problems, obesity and cancer. A cup of brown rice provides 218 calories, 4.5 grams protein, 3.5 grams of fiber, nearly 2 grams of fat and almost 46 grams of carbohydrates, while a cup of white rice contains 242 calories, 4.4 grams of protein, 0 , 4 grams of fat, 0.6 grams of fiber. and more than 53 grams of carbohydrates. Brown rice is a good source of vitamins B1, B3 and B6, while white rice is enriched to replace some of the B vitamins that are lost during the refining process, is that these B vitamins are important for converting food energy and maintain healthy skin and hair. 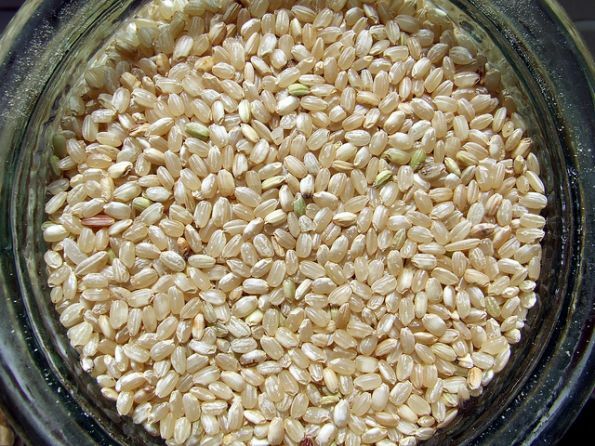 Eating brown rice helps to increase the intake of essential minerals to a greater extent than white rice and provides 86 mg. magnesium or 22% of the recommended daily dose or 150 mg. phosphorus or 15% of the RDA, while white rice only provides 24 mg of magnesium and 69 mg of phosphorus. Often many manufacturers of rice use the same facilities for a variety of food and contact with allergenic foods, such as those containing soy, gluten and nuts, can lead to cause severe reactions in people allergic or intolerant to gluten so it is important to read labels and know if the product is completely free of gluten. 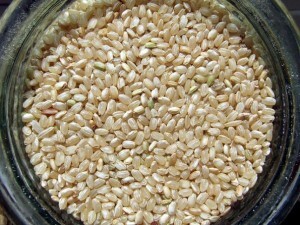 Among the fungi and bacteria that can grow in the brown rice, Aspergillus section Flavi is among the most dangerous, which is a fungus, known as aflatoxin, has the potential to cause cancer if consumed; to avoid it is important to properly prepare and consume rice as soon as possible after cooking to eliminate the risk of aflatoxins. When excess rice after cooking, must keep in the fridge, without exceeding four days because the humid environment can serve as a breeding ground for a variety of fungi and bacteria; tryptophan, an amino acid in the brown rice, can be converted into alpha-picolinic acid, which may cause hypersensitivity and apoptosis, a condition involving the rapid cell death and tissue damage.